We are truly in a golden age of miniature manufacturing! Gamers and collectors have a slew of choices they could never previously dream of at their fingertips, but one niche remains fairly under-served, 28mm metal super hero minis. The reason is because they don’t sell in the thousands and manufactures can make more money selling just about anything else. I think there is a need for high quality, CUSTOMIZABLE metal super hero minis. I make 28mm heroic super hero minis that are designed to have loads of character but be painted easily and quickly. The whole point is to get them on the table! I don’t think miniatures are made to be purchased and languish in a drawer, and I don’t think you do either! I also believe the craftsmanship that goes into producing miniatures doesn’t need to be improved upon! Plastic is a wonderful material, but I like metal minis, they feel right. 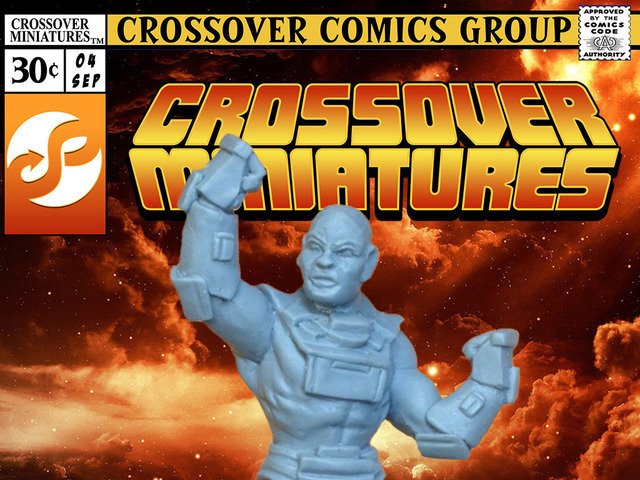 Crossover minis are hand sculpted by an artist, their work is mastered and molded by artisans using time tested methods. Every step of the process is performed by people who are good at their job and I want to pay them a living wage. All work produced by Crossover Miniatures is performed in Europe or the United States, that’s important to us and if you like that idea, I hope you consider joining our community. They were looking to raise $500, and have already pulled in twice that. $18 gets you three figures or a Super Team, to be delivered in February 2015.